FAQ: Do you sell motors for blinds and shades in Nevada? We sell motors for blinds and shades all across USA, including Nevada: Las Vegas, Paradise, Reno, Henderson, Sunrise Manor, Spring Valley, North Las Vegas, Sparks, Carson City, Winchester, Pahrump, Sun Valley, Whitney, Elko, Boulder City, Enterprise, Gardnerville Ranchos, Spring Creek, Incline Village-Crystal Bay, Mesquite, Spanish Springs, Nellis AFB, Fernley, Fallon, Winnemucca, Laughlin, etc. Our radio equipped remote control motors use Radio Frequency (RF) to transmit the control signal. A small antenna in the motor receives the signals and a microprocessor decodes the signals to activate the motor. This system is different from the infrared signal (IR) used on most TV sets. Unlike infrared, the RF signal is not directional - you do not have to point the remote at the roller blinds or shades. The radio signal is also capable of passing through walls and can reach anywhere inside a typical home. Our multi-channel remotes have up to 14 channels that can be programmed to control blind motors in various different rooms and hallways throughout the house. 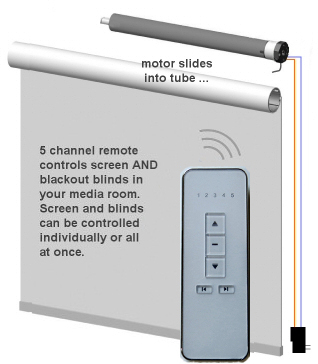 Multiple blinds can be assigned to a single channel, and multiple remotes can be assigned to a single blind. We sincerely hope you enjoy using these advanced motors; if you have any questions, please feel free to contact us at any time! Copyright © 2010-2016 RollerTrol™ Automation Systems. All Rights Reserved. Design, Hosting and Database Management by Aerohost Web Systems.